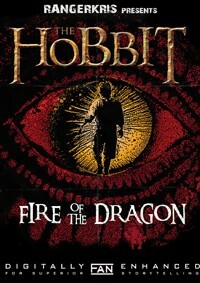 The epic adventure of Bilbo Baggins, retold with quicker pacing and all the action. This is the lean version which retains all the greatness of the movie and drops all the fluff, making it a better paced and more entertaining movie overall. 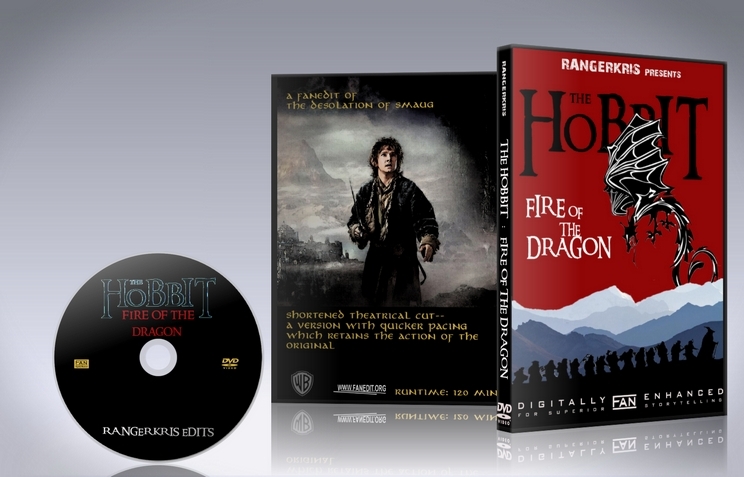 Fire of the Dragon dispenses with many superfluous elements of the film like the elf-dwarf love triangle, the dwarves being left behind in Laketown, the orc assault on Laketown, as well as any other deviations from the main narrative. When I watched Desolation in the cinema, I remember what a good start the movie had, and how awesome and well crafted the scenes with Smaug were, while how frustrating it was every time they cut away to some nonexistent plot device (ie. Tauriel and Legolas, Bard running around Laketown, Bolg attacking Laketown, etc.). I don't know why but the way they drew this movie out to nearly 3 hours by padding it with extra materials which took great liberties with the source material, a book I loved since I was a kid. As much as I admire Peter Jackson as a director, I felt like Desolation was a good 2 hour movie trapped in a 3 hour mess. This version cuts out the extra material and keeps the narative focused on Bilbo. 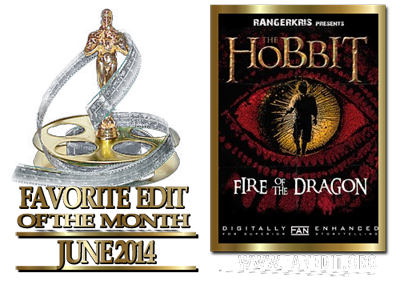 I used Adobe Premiere Pro to edit the Desolation of Smaug blu ray. I took notes on how I wanted the scenes to flow and edited them as such. 8. Barrel scene left intact. The Kili/Tauriel concerned glance is cut. Kili's arrow to knee is bound and never spoken of again. He's all better in this version. 9. Cut scene of Legolas interrogating an orc, as well as Bolg tracking the dwarves. 17. The end credits scored with Misty Mountins Cold from An Unexpected Journey, before I See Fire. Now saying that, I was hugely disappointed. Yes the love triangle and the elves antics are gone, but this is still a rubbish movie, no offence to Ranger613, it's not his fault. There is just no tension and it still feels like everything is pointless and it is just leading to a battle with a dragon. The scene at the beginning at Beorns house is completely pointless, they get some horses, then swiftly abandon them and go into a forest. Wtf? Likewise going to the elves achieved nothing and even laketown and going up in the toilet. There is ZERO character development and ZERO tension. None of it matters. Being a fan of the book, Ranger613 did an excellent job as usual and it was my mistake in downloading the wrong film, I'm sure his other version is superior in every way, but I'll hold out for a three in one where this film is almost completely cut out. I just recently watched Desolation of Smaug, took me this long because I was let down by "An unexpected journey". Being a person who has read LOTR, Silmarillion, Hobbit and Unfinished Tales several times, I was very disappointed with the direction that Peter Jackson has taken with The Hobbit. It seems like he has gotten the same "sickness" as Lucas, CGI and action overload and bad narrative. I must say that I enjoyed this edit much more than the original, even though I think even more could be cut (but here "Into the Fire" will be for me"). At a technical note this edit is very good, couldn't detect where the cut's was made. When It comes to narrative an enjoyment I had to take some points away. Even though I liked it more than the original, the original film is such a mess that it's a difficult (impossible?) task to edit this into a really good film. But as I have read on the forum, some of the scenes I feel is over the top and included in this version will be cut and trimmed in "Into the Fire", so really looking forward to that one. I don't think we will have a really good version of this film until "Battle of the five armies" is released in EE. Then the very talented editors will see all they have to work with, and how much they can cut in these films. The disorienting introduction to the Hobbit part 2 is still present. Although I don't know how you could explain how our heroes got from the relative safety at the end of the Hobbit part 1 to the dangerous beginning of the Hobbit part 2. The edits at the end of the film, namely the chase sequence in the Lonely Mountain and Laketown where welcome. They moved the story along at a far superior pace to the theatrical cut. The editing of the chase scene in the Lonely Mountain left me a bit spatially confused. I found it difficult to figure out where the other characters where that where off screen but obviously still running about. This was not a problem with the Theatrical cut of the film and possibly the reason for the unwanted extended chase scenes. The only problem I had with the Laketown sequence being cut was I don't think you cut enough. At one point the action jumps from the chase in the Lonely Mountain back to Laketown. We get a scene with Bard's daughter saying something and Bard grabs his arrow from the ceiling of his home. Then the action jumps back to the Lonely Mountain chase. As Smaug never actually reaches the town that scene could have been removed. Cutting that scene may have caused more continuity problems in editing than it was worth however. Regardless, it was a bit jarring going from the well paced action sequence of the Dragon chase to a man grabbing his arrow then back to the chase. Overall this cut was better experience and I am happy that I had an opportunity to view it. I loved Desolation of Smaug when I saw it in theaters. It felt more like a Lord of the Rings film than its predecessor did. I've read The Hobbit, but I didn't mind the additions Jackson made to the film, and for the most part, the film didn't really drag that much. However, as was the case with edits of Unexpected Journey, I never really noticed (or cared, take your pick) how bloated the film was until watching Ranger's cut. Ranger skillfully cuts away the extra fat of the film without sacrificing any of the core story of the film. That's right, a little over 40 minutes cut and nothing truly important was left out. That being said, leaving out four of the dwarves staying behind in Laketown and the love triangle means that this version of the film probably won't mesh perfectly with the theatrical version of Battle of the Five Armies. 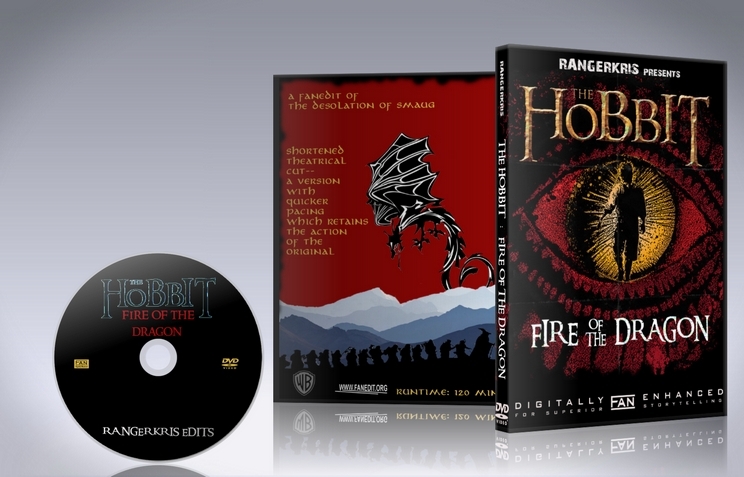 Ranger has said that he intends to edit the entire trilogy, so there is certainly that to look forward to. As a film on its own, though, this is a great edit and I can't find a reason to not recommend it to anybody. Keep up the good work, Ranger. I'm looking forward to seeing more of your work. We all are! After seeing Desolation in both 2D/3D and much lamentation, I could not heartily recommend it to any but the most devoted of Tolkien fans. The excessive use of green screen, extended drivel of a love interest and meandering motives of Thorin left me wanting. Smaug, while a lengthy portion of the tail end of the film, added some respite from the failure to tighten the script. ranger's edit does precisely what I hoped it would do. I nearly forget the parts that were cut, helping maintain a good pace, while not overexposing some of the later mysteries. Many edits trim too much, leaving holes in your narrative that are filled by past viewings. My wife watched this cut after a single viewing of theatrical Desolation and enjoyed it far more than the original without being able to explain why. That's a high water mark for me. Helping to focus the viewer on the key story elements brought out more of the magic of Bard and the Master, which I was a bit too tired to enjoy after the first hour of orc-riding elves and pointless love connections. Again, bravo. Looking forward to your next edit.